What is Interaction Overview Diagram? Current: What is Interaction Overview Diagram? 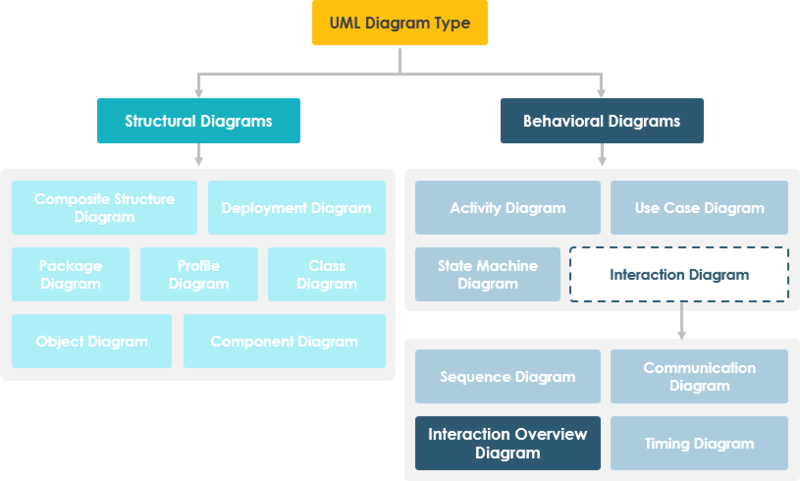 UML Interaction Overview Diagrams provide a high level of abstraction an interaction model. 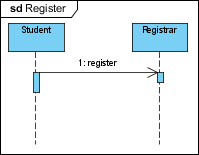 It is a variant of the Activity Diagram where the nodes are the interactions or interaction occurrences. 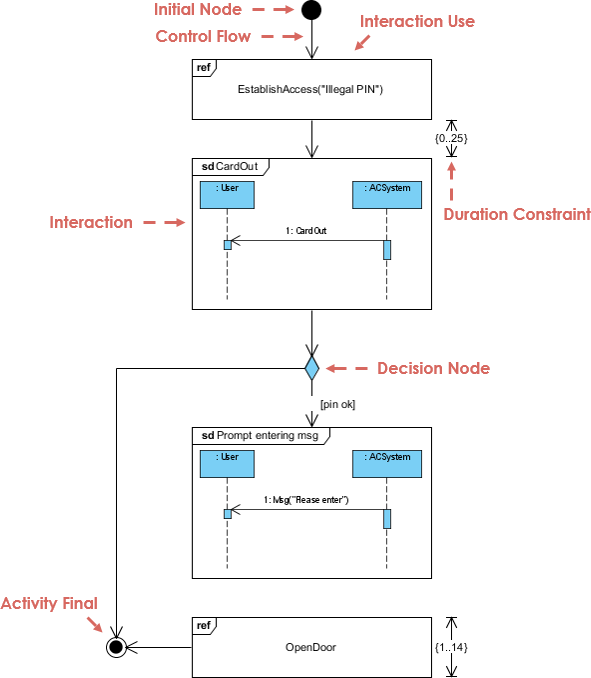 The Interaction Overview Diagram focuses on the overview of the flow of control of the interactions which can also show the flow of activity between diagrams. In other words, you can link up the "real" diagrams and achieve high degree navigability between diagrams inside an Interaction Overview Diagram. 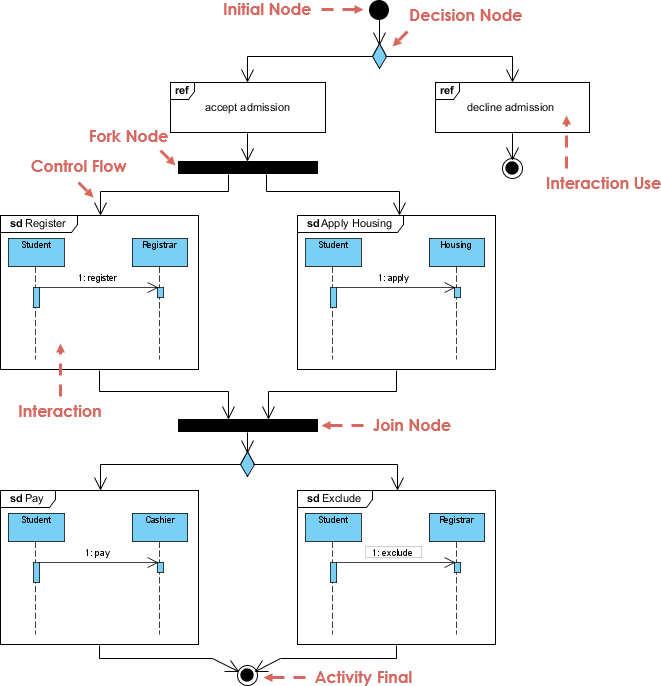 Interaction Overview Diagram is one of the fourteen types of diagrams of the Unified Modeling Language (UML), which can picture a control flow with nodes that can contain interaction diagrams which show how a set of fragments might be initiated in various scenarios. Interaction overview diagrams focus on the overview of the flow of control where the nodes are interactions (sd) or interaction use (ref). The other notation elements for interaction overview diagrams are the same as for activity and sequence diagrams. These include initial, final, decision, merge, fork and join nodes. The example above shows a student who has been accepted into a university. First the student must be accept or decline admission. After accepting, the student must both register for classes and apply for housing. After both of those are complete, the student must pay the registrar. If payment is not received in time the student is excluded by the registrar. An Interaction diagram of any kind may appear inline as an Activity Invocation. Large and complex sequence diagrams could be simplified with interaction uses. It is also common to reuse some interaction between several other interactions. The Interaction EstablishAccess occurs first with argument"Illegal PIN" followed by an interaction with the message CardOut which is shown in an inline Interaction. Then there is an alternative as we find a decision node with an InteractionConstraint on one of the branches. Along that control flow we find another inline Interaction and an InteractionUse in the sequence. 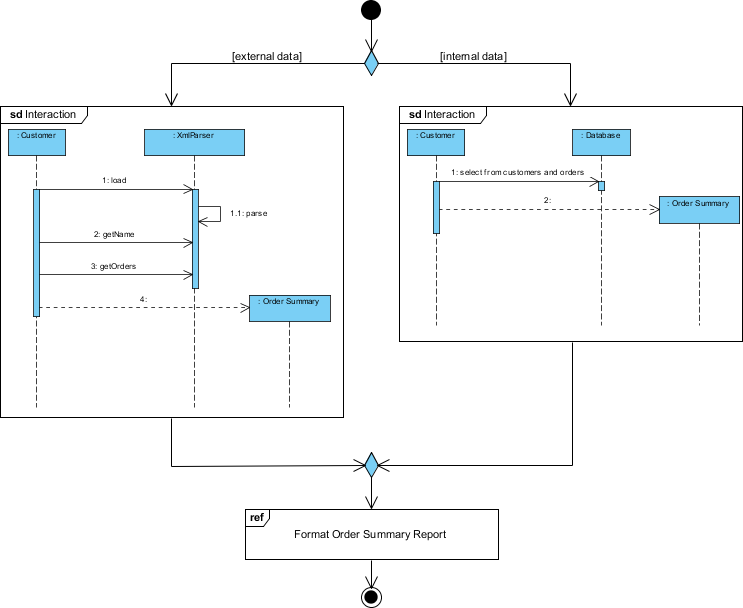 In this diagram, we want to produce and format an order summary report. If the customer is external, we get the information from XML; if internal, we get it from a database. Small sequence diagrams show the two alternatives. 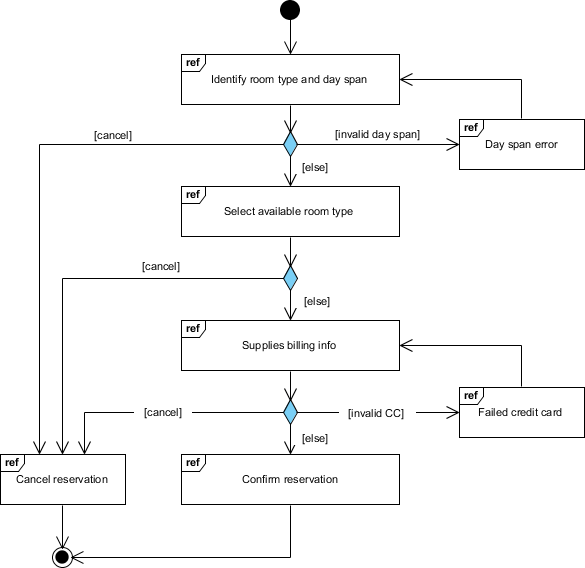 Once we get the data, we format the report; in this case, we don't show the sequence diagram but simply reference it with a reference interaction frame. 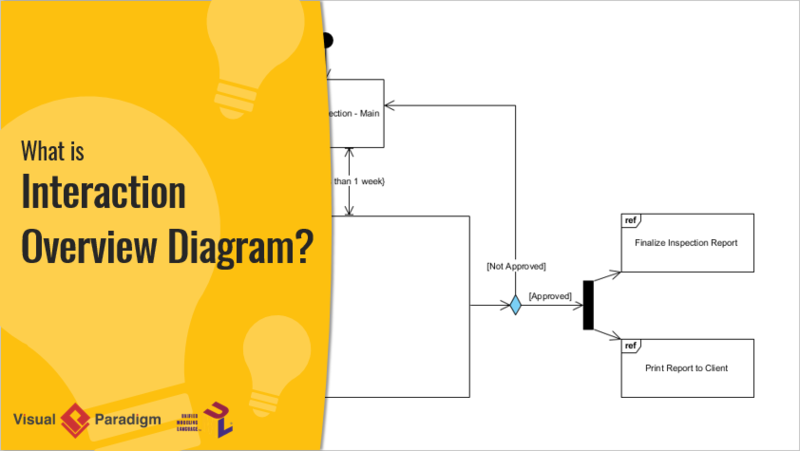 You've learned what a Interaction Overview Diagram is and how to draw an Interaction Overview Diagram. It's time to draw an Interaction Overview Diagram of your own. Get Visual Paradigm Community Edition, a free UML software, and create your own Interaction Overview Diagram with the free Interaction Overview Diagram tool. It's easy-to-use and intuitive.